Apple's most recent OS release, the divisive iOS 6, hasn't gone off without a hitch, but the update's issues haven't stopped tons of Apple fans from upgrading their devices during the last half of September. iOS 6 was pushed out to compatible versions of the iPhone, iPad, and iPod touch on Sept. 19, and within one day, 15 percent of those devices were running the new OS, according to data from advertising and research firm Chitika. The most contentious aspect of Apple's new iOS 6 is easily the Apple Maps app that replaced Google Maps. It's been criticized for its inaccurate data and generally sloppiness. Nevertheless, iOS 6 adoption during the new OS's first two days of availability reportedly occurred 122 percent faster than iOS 5 upgrades when that OS version was released in 2011. According to Chitika's figures, which the firm deduced by tracking millions of users' mobile ad data from Sept. 18 to Oct. 1, iPhone users are the leaders in iOS 6 adoption. Up to 60 percent of iPhone users have already upgraded to the new iOS 6, while that number falls to 45 percent for iPad users and 39 percent for iPod touch users. 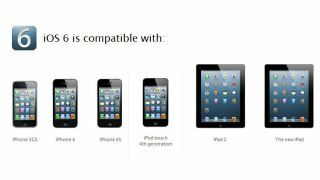 As Slashgear pointed out, though, more hardware versions of the iPhone are compatible with iOS 6 when compared with the various iPad and iPod touch models, which may explain the higher upgrade rate for iPhone users. iOS 6 is compatible with the iPhone 3GS, iPhone 4, and iPhone 4S, and comes standard on the iPhone 5, though some features - like Siri - may be missing on older devices. On the other hand, any iPod touch released prior to the 4th gen iPod Touch won't vibe with iOS 6, and even the original iPad can't be upgraded to the new OS. So those lower adoption rates shouldn't come as a surprise. Apple's switch to its own internal maps app has caused quite a controversy, with Apple CEO Tim Cook publicly apologizing and even suggesting that iOS 6 users go with a competing maps app - like one from Microsoft or Google - for now. In fact, it seems based on some data that 24 out of 25 users took that advice to heart. But it's already been posited that iPhone users feel more brand loyalty than users of other smartphones, which may explain why they're choosing to upgrade their devices to iOS 6 despite the uproar over sloppy maps data. Then again, maybe they just can't stand the little red badge on their settings app that won't go away until they upgrade to the new OS.